When Associate Professor Krislert Samphantharak makes a tour through Southeast Asia, there’s a good chance he’s going to see one or more of his former students. And it’s not just because the UC San Diego School of Global Policy and Strategy (GPS) has such a strong alumni network there—and across the globe, for that matter. It’s because he wants to keep in touch with them, just as he did when they were students. Appropriately so, Samphantharak is serving as the School’s associate dean for student affairs. Amid being Acting Dean Gordon Hanson’s right-hand man on administrative items related to student affairs, the associate dean for student affairs also is tasked with ramping up interactions between faculty and students. That means possibly introducing new opportunities for intermingling and encouraging an open-door atmosphere for students to seek out faculty with questions or concerns—basically, what Samphantharak already is very good at and sees value in. 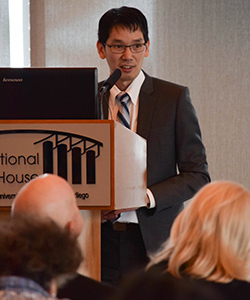 With every passing school year, Samphantharak said, students pressure his stance on topics or ask new questions that make him look at his lecture materials or research differently. Samphantharak’s research focuses on finance and economic development issues, particularly related to roles of households and firms in Southeast Asia. In the past year, he’s been putting into practice this expertise, as well as common GPS strengths in quantitative methods and data, for the Bank of Thailand to help it launch a new research institute, Puey Ungphakorn Institute for Economic Research (PIER). 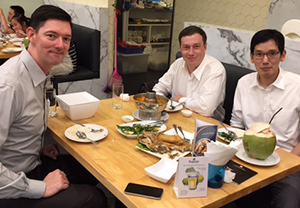 Samphantharak, in addition, is collaborating with PIER on two research projects. One regards how to use credit bureau data to evaluate the impact of fiscal stimulus on household debt. The other uses import-export data to analyze how financial access affect firms’ access to foreign markets. Never one to stop learning, Samphantharak said he has a few new realizations to bring into the classroom this year, thanks to his work at PIER. As well in the new school year, Samphantharak is on track to wrap up his forthcoming book, “Economic Development of Southeast Asia,” for MIT Press. A comparative study of economic development across 11 countries in the region, Samphantharak said the project hasn’t been without challenges, given Southeast Asian countries are fast-changing. Consider Myanmar, he said, which was mostly closed to foreign investments when he began writing the text, but now is open. “Things change so fast, and it keeps you on your toes to follow what’s going on,” he said. Gratefully, Samphantharak said, he has plenty of help and supporting materials from his colleagues and students motivating him to get the product to print. Finance is an important factor in economic development. My research focuses on how financial access could help poor households and small businesses in developing countries generate higher income and reduce vulnerability to adverse events. My goal is to teach students how to apply economics and finance principles and analytical skills to the real world. This is not only useful for students planning to work in business-related areas, but for those in development, public policy and politics as well. My academic interests are on finance and economic development, with a special regional focus on Southeast Asia.